Members only. Non-member guests will be charged $10. Check-in attendees at the door and help the garden owner with other tasks. Please arrive 30 minutes before the event. 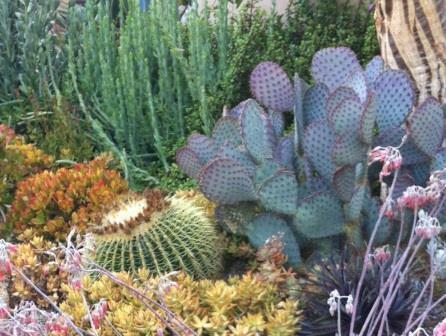 Hidden in the eastern area of Fallbrook, the home of Jeanne and Barry Meadow contains one of the country's most beautiful cactus and succulent gardens. It has been featured in several recent publications including Better Homes and Gardens Country Gardens (Spring 2014) and San Diego Home and Garden (April 2014). The infinity pool in the front yard is surrounded by palms, and more than 50 pots overflowing with succulents. The lovely view to the west overlooks more than a hundred avocado and fruit trees. But it is the backyard which is the central attraction, with its breathtaking collection of both popular and unusual succulents. Wander along the graceful pathways that take you past raised vegetable planters and potting areas, along with numerous places to sit and relax. There is a long, steep driveway, but the gardens are flat and paved. Our hosts will offer rides from the ample street parking. This event is FREE and for Society Members only.